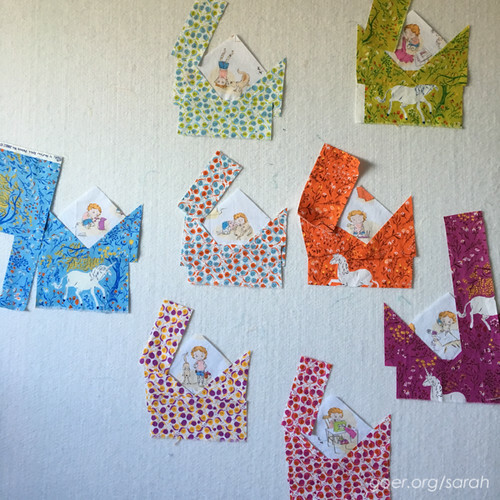 WIP Wednesday: What’s in the Cards? I'm one full week into the kids being back in school. I'm enjoying the time to catch up with friends, and to tackle some projects around the house, but also the longer stretches of uninterrupted time in my sewing room. Since the kids are back in school I have a lot more flexibility in my schedule. It's the time of year when I reassess what my priorities are in all avenues of life. I've spent some of the last week organizing my sewing room. Since I work on multiple projects at once, organization is key and the room can get cluttered very quickly. 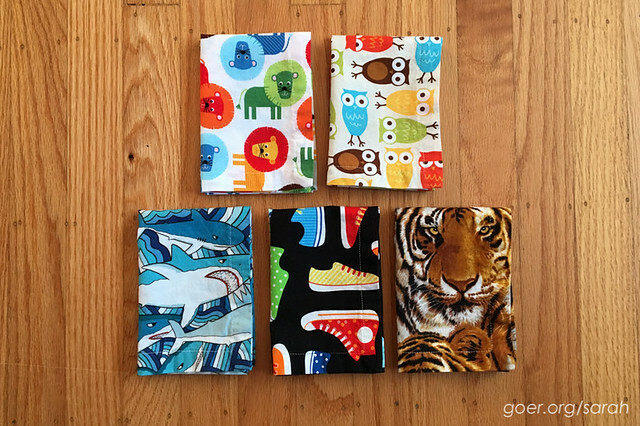 I also have some new fabric acquisitions, from shopping while on vacations this summer, and a couple online orders. I prewash my fabric before it gets shelved so it will be ready to go when I am. But this creates homework right when the fabric comes into the house. I machine wash and dry, and as long as I pay attention and remove promptly from the dryer I don't generally feel the need to press it before folding. The task isn't too bad when I actually do it. Looking at the pile can be daunting though. So I've been working on my pre-washing pile. It's a little out of hand at the moment. 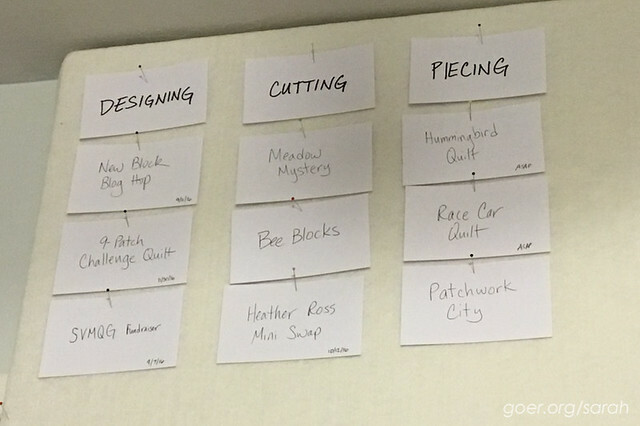 Last week, I shared my index cards that I'll be using to help me stay focused on my sewing and quilting priorities. I don't just work on one project at a time, start to finish, so I have lots of projects all going at the same time. 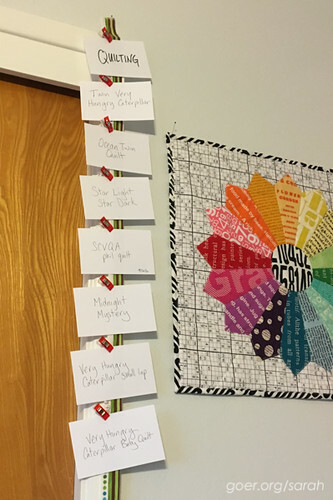 Once I titled an index card for each current project (WIP and upcoming) I got a little overwhelmed. (There are over 30. I didn't count.) And it's not like there's a simple order of what is first, second, and third. The system is a work in progress, but here's what I've got so far. I pulled all the cards for completed quilt tops. They are hanging together roughly in priority order. I like having projects in a variety of stages to choose from, so as I flipped through the rest of my cards and pulled out those I'd consider a priority (or which I wanted to make a priority) due to deadline or interest. I grouped them into similar stages, which determined my categories: Designing, Cutting and Piecing. Nothing too profound here, but for instance, being reminded of all the projects I needed to do cutting for meant I could easily pull one project after another to cut fabric while I was focusing on that particular task. Hard to see, but the cards have a due date, if applicable, on the bottom right corner. Things change, but these can be easily moved around since I just have them pinned to the top of my design wall. So far, it's helping. 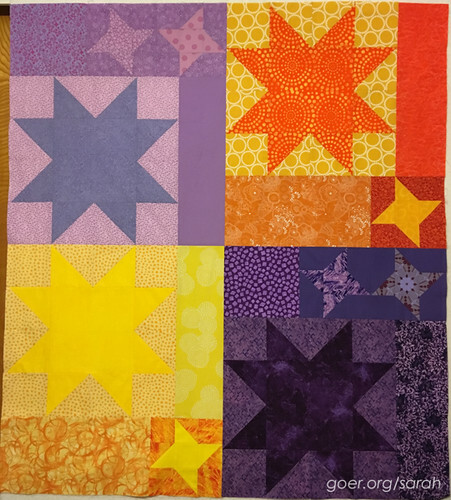 I moved the Race Car Quilt from Piecing to Quilting, I've made quite a bit of cutting progress, and I was able to focus one one of my design tasks while I was out with my sketchbook at the beginning of the week. I'll need to revisit my full deck of projects from time to time to fill in as projects progress and to check for upcoming deadlines. 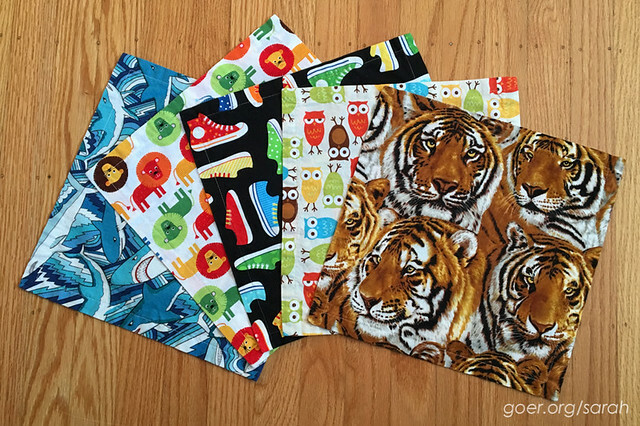 It took me five late night sewing sessions (procrastinator mode) to finish them, but here are the five cloth napkins that my son will be using as placemats at school (a requirement now that he's in first grade). The fabrics all came from his stash, but it seems the owl fabric made it in there unwashed, because there was substantial shrinkage when I washed it the first time. It doesn't really make a difference to the "set" but the owl napkin is about 1/4" shorter in one direction and 1/2" shorter in the other direction than the rest of the stack. I finished my Star Light Star Dark quilt top. 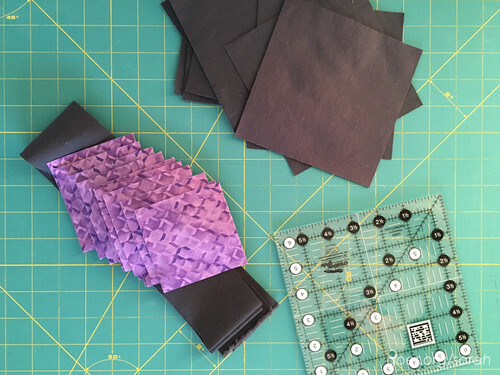 Next up, I'll decide what I'm going to do for backing fabric and start considering quilting options. There's a linkup with prizes September 19 - October 3, so there's still time for you to join in the QAL even if you haven't started. It goes together so quickly! 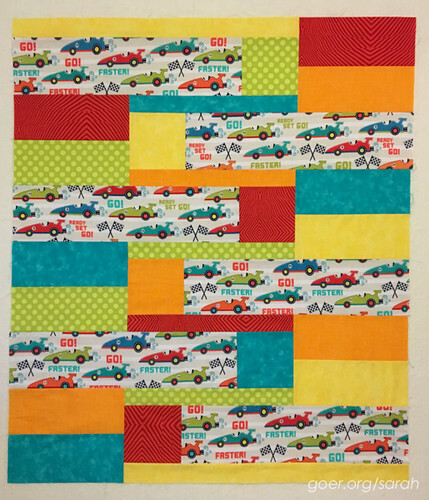 I just love bright colors and this adorable race car fabric! I designed the quilt with the race car fabric in mind, to make the best use of it without chopping it up too small. I'm excited to get this done and love how quickly it went together. My son is down to one long seam on his twin sized quilt. Maybe that will get done during the three day weekend. 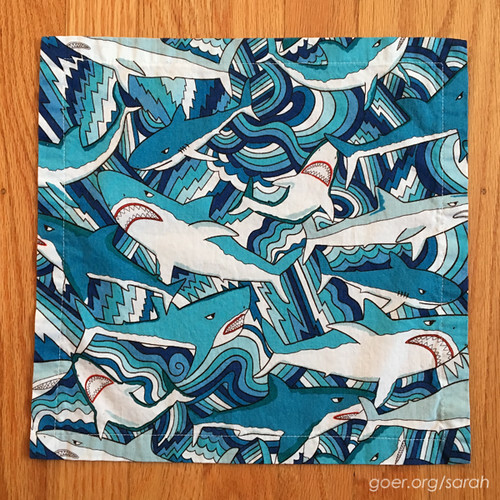 Posted in Quilting on August 31, 2016 by sarah. Can I just say that your daughter has an eye for fabric? Because that rocks. Also, your card system is genius! I love your in depth WIP posts. Thanks Jess. Don't worry. She's 4. The backing doesn't coordinate at all. ;-) I'm excited about my cards. I may need to create a special board for them, because the only problem with them being at the top of my design wall is that I need a stool to reach them. At least the stool lives just next door in the laundry room. I am very intrigued by your organization system...and may have to adapt it for my own growing list of projects! 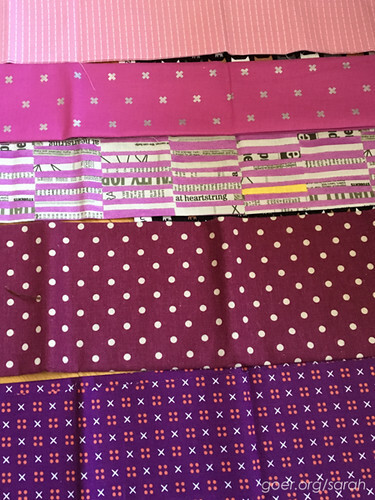 I just love your daughter's fabric pull for her 2nd quilt--purple just like her mother!! And I am still trying to figure out the construction of your race car quilt--I am assuming quite a few partial seams?!? Either way--it looks fabulous!! Thanks, Mel. It's so important to be able to keep track of all we have going on. I think the quarterly WIP blog post really helps me keep everything on my radar, but I've tried to prioritize that list and it's impossible. Even if I could when I posted, my priorities change often. ;-) Yes, the race car quilt... every horizontal seam between the cars and the short skinny rectangles is a partial seam. And as for the little one, I think most of her stash at this point is purple. :-) Thanks for visiting!